This article was originally published at www.aopa.org and reposted here with permission. At least once a year for as long as I can remember, I have been contacted by an aircraft owner whose piston aircraft engine was destroyed or severely damaged by a destructive detonation or pre-ignition event. In one recent 12-month period, I encountered three such incidents. 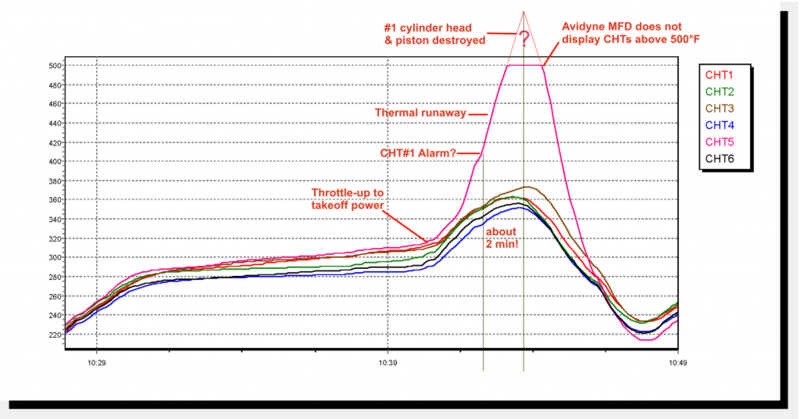 Everything looked fine until about two minutes after the pilot applied takeoff power, at which point the #1 cylinder’s CHT began to climb rapidly compared to the other five cylinders. At the three-minute mark after brake release—with the aircraft at roughly 2,000’ AGL—CHT #1 rose above 400°F and set off a high-CHT alarm on the MFD. CHT #1 continued its rapid rise—nearly 1°F per second—that continued unabated until the piston and cylinder head were destroyed approximately five minutes after takeoff power was applied and two minutes after the CHT alarm was displayed. At that point, since the cylinder was no longer capable of combustion, CHT #1 started plummeting. We can’t be sure just how hot CHT #1 got because the Avidyne EMAX system “pegs” at 500°F. A reasonable guess is that the CHT peaked somewhere between 550°F and 600°F. No cylinder or piston can tolerate such conditions for very long, and this one obviously didn’t. 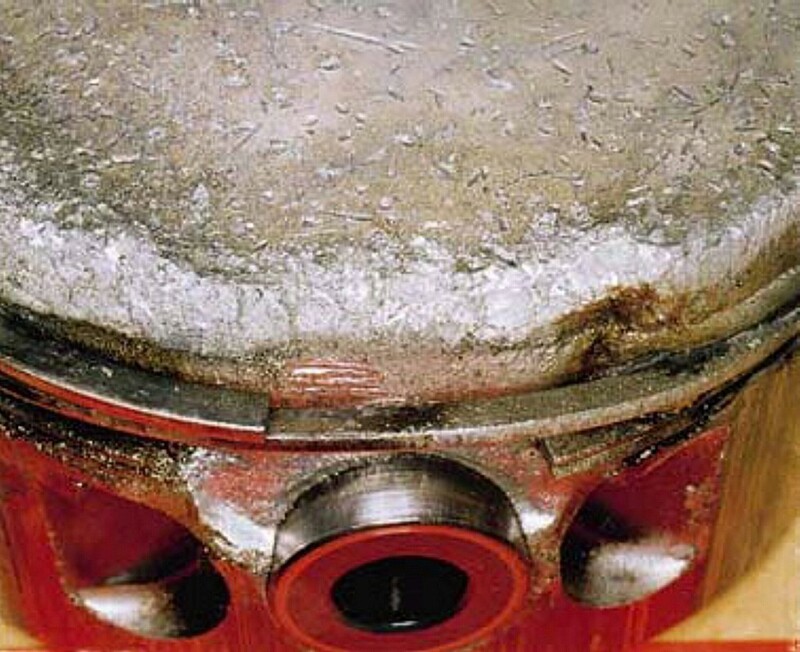 Note the melted corners of the piston crown, the destruction of the top compression ring lands, and the severe metal erosion above the piston pin. 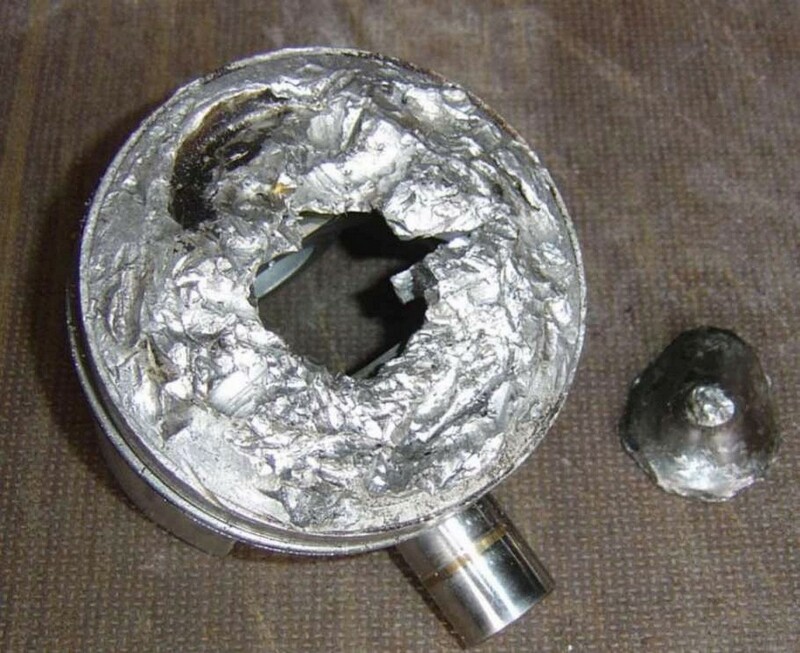 (Much of this molten metal wound up inside the crankcase and contaminated the bearings and oil passages.) Also note the severely hammered appearance of the piston crown, the classic signature of heavy detonation. The cylinder head was found to have a big chunk of metal missing from it. Both spark plugs were destroyed by the event as well. This engine was a low-time Continental factory engine, so the owner figured that the severe engine damage would be covered under Continental’s warranty. I advised him not to bother filing a warranty claim, because I've never known Continental to give warranty consideration for a destructive detonation or pre-ignition event. Continental considers this to be operational abuse, not a defect in materials or workmanship, and therefore not covered by warranty. (For what it’s worth, I agree with Continental’s position on this.) The owner didn't believe me and filed a warranty claim anyway. Continental promptly and unequivocally denied the claim, just as I predicted. The moral of the story is that it is important for aircraft owners to have a good digital engine monitor installed, to know the telltale symptoms of destructive detonation and pre-ignition, and to act fast when those symptoms appear. You may have less than one minute to react if you want to save your engine. In yet another case (for which I unfortunately have no photos), a drop-dead gorgeous Lancair IV-P kitplane powered by a fire-breathing 350-hp TCM TSIO-550 engine went up for its first test flight after 10 years of laborious building time by the owner. Within minutes, the airplane was back on the ground with an engine that was totally destroyed. A forensic post-flight evaluation revealed that the magnetos had been timed approximately 10 degrees advanced from the proper timing. That turned out to be a $50,000 mistake. The Lancair’s instrument panel was wall-to-wall glass, including an ultra-sophisticated digital engine monitoring system. The engine monitor was literally crying out for attention throughout the short test flight, but the test pilot never noticed its warnings until the engine cratered. There are a number of things that can cause or contribute destructive events like these. I've already mentioned one: advanced ignition timing. It’s astonishing how often we see engines with the magneto timing advanced several degrees from spec. (E.g., 25° BTDC when the engine data plate calls for 22° BTDC.) Even a couple of degrees is enough to significantly reduce the detonation margin of the engine. Add a hot day and perhaps a cooling baffle that isn’t quite up to snuff, and BOOM! Owners should be particularly alert for mis-timed magnetos whenever maintenance is done that involves magneto removal or adjusting magneto timing. (More often than not, these occur during the annual inspection.) If mag timing is advanced, you’ll notice that your EGTs are lower and your CHTs are higher than what you were seeing prior to maintenance. (Retarded timing results in the opposite: higher EGTs and lower CHTs.) If you notice this after the airplane comes out of maintenance, take it back to the shop and have the mag timing re-checked. It’s a quick check and could save your engine (not to mention your gluteus maximus). Magnetos are required to be timed within one degree of the timing specified on the engine’s data plate, and any error should be in the retarded direction. Another common culprit is inadequate fuel flow on takeoff. When taking off from a near-sea-level airport—or from any elevation if you’re flying a turbocharged airplane—you need to see fuel flow that’s right up against the red-line on the gauge (or the maximum fuel flow shown in the POH). Unlike most other gauges on your panel, hitting red-line on the fuel-flow gauge (or even going a smidgen over) is a good thing, not a bad thing. Takeoff fuel flow is a lot like tire pressure—a bit too much is a whole lot better than a bit too little. Anything less than red-line fuel flow on takeoff reduces the engine’s detonation margin, and significantly less can reduce it enough to cause a catastrophic event. Not long ago, a client of my maintenance-management firm had a prop-strike incident that required a teardown inspection of the engine. When the inspection was complete and the engine was reinstalled in the airplane, the owner picked up the airplane from the engine shop and flew it back to his home base airport. Upon arriving there, he informed us that the fuel flow was 3 GPH below red-line on takeoff, and asked that we schedule a service appointment to have the fuel flow adjusted. I was flabbergasted. What was this owner thinking? Why didn’t he abort the takeoff immediately when he noticed that the fuel flow was 3 GPH short, and ask the engine shop to adjust it? Why would he fly the airplane home in that condition? What part of “inadequate detonation margin” didn’t he understand? Second, set your engine monitor CHT alarm to 400°F or less for Continental engines and 420°F or less for Lycoming engines. (On my own Continental-powered airplane, I have my alarm set to 390°F.) When the alarm goes off, do whatever it takes right now to bring the CHT back down below 400°F. Verify that the mixture is full-rich. Turn on the boost pump if it isn’t already on. Open the cowl flaps if you have them. And if CHT triggers the alarm and appears to be rising rapidly, throttle back aggressively to stop the thermal runaway. Don’t be shy about doing these things immediately, because you may only have a minute or two to act before your engine craters. When you get on the ground, put the airplane in the shop and have the spark plugs removed and inspected for damage, the cylinders borescoped, and the magneto timing checked. If takeoff fuel flow was short of red-line, have it adjusted before further flight. Mike Busch is arguably the best-known A&P/IA in general aviation, honored by the FAA in 2008 as National Aviation Maintenance Technician of the Year. Mike is a 7,500-plus hour pilot and CFI, an aircraft owner for 45 years, a prolific aviation author, co-founder of AVweb, and presently heads a team of world-class GA maintenance experts at Savvy Aviator. Mike's book Manifesto: A Revolutionary Approach to General Aviation Maintenance is available from Amazon.com in paperback and Kindle versions.